Drugs company Sanofi has plans to fly supplies of flu vaccine into the UK if other transport routes are disrupted after the country leaves the EU. Hugo Fry, the managing director of its UK arm, told BBC Radio 5 live's Wake Up To Money that the flu vaccine was one it was not possible to stockpile. "We prepare in different ways and have prepared many different routes into the UK," he said. "If we have to in the end, we will airlift it in." He added: "We are eating the cost of that but patients and citizens are our primary concern, so we're quite happy to take that cost and make that planning." Health Secretary Matt Hancock said: "Those sorts of medicines can be flown in and we have plans for that. I pay tribute to Sanofi and other pharmaceutical companies - they have done an enormous amount of work to make sure people will be safe and medicines can flow. "In the health department we don't use the word guarantee, as this is a complex system and there are lots of levers beyond our control such as how the French government responds on the Dover/Calais border. "However, Sanofi have done a tremendous amount of work to ensure people can get their drugs unhindered and if necessary we'll fly them in." 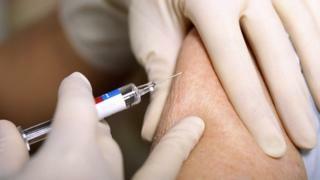 Sanofi says it is the second biggest of three suppliers of flu vaccines in the UK - behind Seqirus and ahead of Mylan. While Sanofi has plans to keep stockpiles of insulin and vaccines in place for 12 months, Mr Fry said this was not possible with the flu vaccine. "You can't stockpile it because it's made at a particular time of the year and it's only available to import in the month at the end of August/beginning of September," he said. Last August, Sanofi said it was increasing its stocks by four weeks to give it a 14-week supply of medicines. Most of the French company's supplies enter the UK through the Channel Tunnel and disruption to that route in 2005, when there were strikes in France, led to around four weeks of disruption. Mr Fry added: "We're doing everything possible to make sure that everyone will get their medicines and vaccines so that they can be reassured and they don't have to worry about it. He added that the day after Brexit happens, patients would be able to get their hands on all drugs that it was possible to stockpile. For the current flu season, Sanofi provided more than seven million vaccines to the UK. There are different vaccines for people aged under 65 in at risk groups and for people who are older than 65. Sanofi and Seqirus supply both age groups, while Mylan have vaccines only for the younger of the two age groups. There is a tender process to decide which company provides vaccines in Scotland and Northern Ireland, while in England and Wales, GPs decide who will supply the vaccines. The tenders for the 2019-20 flu season have already come out, while doctors are currently in the process of deciding who they want to be their supplier.